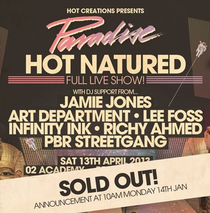 Hot Creations recently announced the addition of a new O2 Brixton Academy date on Friday 12th April after overwhelming demand for ‘Paradise’ tickets, featuring Hot Natured (live), on Saturday 13th April, completely sold out. The live debut of the collective featuring Jamie Jones, Lee Foss, Luca C and Ali Love at London’s O2 Brixton Academy comes on the back of a big 2012 for Hot Natured, which saw the group release the huge crossover hit 'Benediction' on their own Hot Creations label, and the acclaimed launch of the Paradise night In Ibiza. The brand also announced that they have signed to Pete Tong's FFRR / Warners label. The group is currently putting the finishing touches to their debut album, which is set for release later in 2013. DJ support on the night comes from Jamie Jones, Tale of Us, Lee Foss, Richy Ahmed, Robert James and Russ Yallop.